This video walkaround of the Panther Ausf. 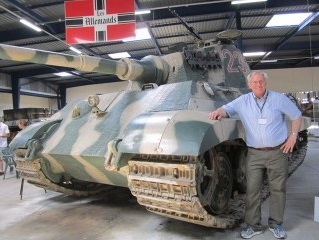 A. at the Saumur Tank Museum appeared on youtube yesterday. This video appeared on youtube yesterday showing a T-34/85 moving out at Saumur Tank Museum for the Concours International de Maquettes 2016. The blog “Armored Patrol” is featuring a nice series of posts on the Saumur Tank Museum in France by “Harkonnen.” The article is in four parts. Click on the pictures below to go to each part. The Armored Patrol is a blog primarily of news about World of Tanks and other tank themed video games although they also feature historical themed articles.